At 0642 on April 16, 1945, Flight Petty Officer 1st Class Gensaburō Matsumoto took off from Kushira Air Base as radio operator/gunner in a Tenzan carrier attack bomber (Allied code name of Jill) carrying an 800-kg bomb and died in a special (suicide) attack off Okinawa at the age of 18. 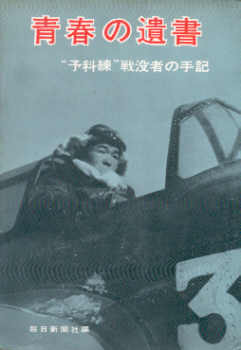 He was a member of the Kamikaze Special Attack Corps Kikusui Unit Ten'ō Squadron. He was from Fukushima Prefecture and was a member of the 12th Kō Class of the Navy's Yokaren (Preparatory Flight Training Program). Finally I will make a sortie. Please forgive me for my lack of filial piety up to now. When this letter arrives, I will be fighting admirably. This probably will be my last letter. I am writing this as now I am very busy. In my prior letter I told you what was in my heart. Everyone, please be well. I pray for divine assistance for this. I am determined to fight admirably and die. When you receive notification of my death in battle, please say "well done" and praise me. The crews are switched for the planes. The crewmen already have been aligned. I am working hard in high spirits. Give my regards to everyone. Excuse me for the sloppy writing. The letter comes from Mainichi Shinbunsha (1968, 129). The biographical information in the first paragraph comes from Mainichi Shinbunsha (1968, 129), Osuo (2005, 211), and Uchida (2008, 11). The names of Gensaburō Matsumoto and the other two crewmen in his Tenzan carrier attack bomber did not show up in the official notices of special attack deaths. However, Uchida (2008, 11) explains that these three names should have been included in the listing of special attack deaths of Kikusui Unit Ten'ō Squadron members on April 16, 1945. Mainichi Shinbunsha, ed. 1968. Seishun on isho: "Yokaren" senbotsusha no shuki (Last letters of youth: Writings of "Yokaren" war dead). Tōkyō: Mainichi Shinbunsha. Uchida, Tarō. 2008. "Kaigun Kushira kichi shutsugeki senbotsusha" (Kushira naval base sortie war dead). Tokkō (Special Attacks) 2008, no. 74 (February): 10-2. <http://www.tokkotai.or.jp/files/kikanshi/tokko_pdf/tokko_74.pdf> (May 17, 2018).